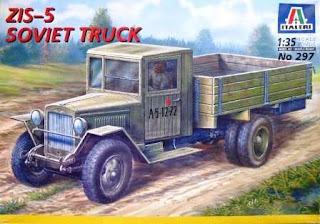 Here's a little project to break the Opel addiction I've been in for WW2 trucks. Italeri's Zis-5. Not that an addiction to building Opel truck's is a bad thing. I really enjoy 'em. But I've been wanting to jump into this one for a while. Finally completed this build. After quite a while contemplating the final details, weathering, etc. this one is done. I appreciate all those of you who have stuck with me through the timelines to get SOMETHING completed and posted. I hope you enjoy the quick pics.. I'll be posting better pics when I can. But, for now.. here she is.. the Exorcist. 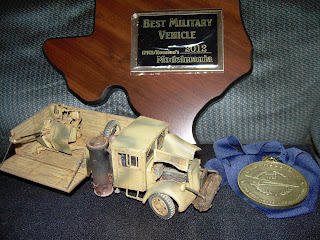 Hard to imagine on the way down to the IPMS Modelmania 2012 show this past Saturday that the Opel would receive 1st place. 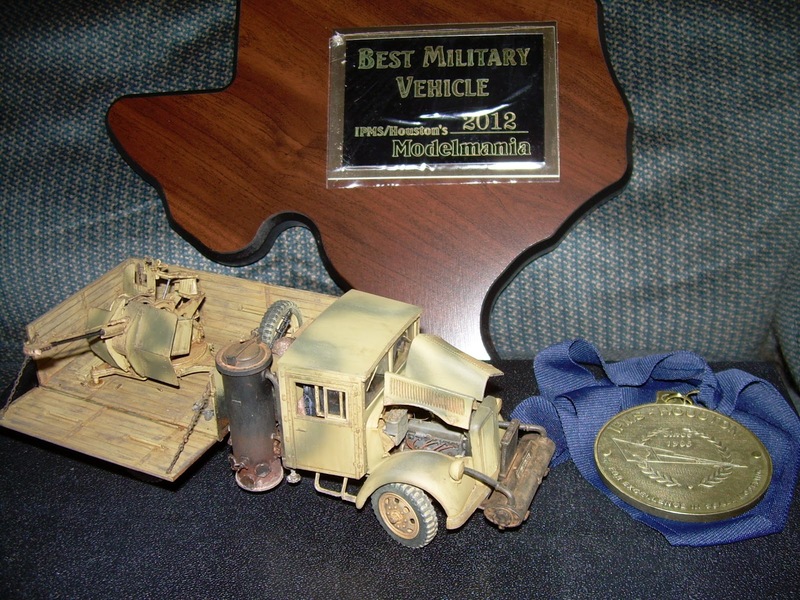 But, not only did she take the medal, this 'ol gun truck was awarded "Best Military Vehicle". I was, um, surprised to say the least. The level of models on display was amazing. Craftsmanship, imagination, passion.. all were very evident in the builds. I'm proud to have been a part of the show, and to meet some great folks there. 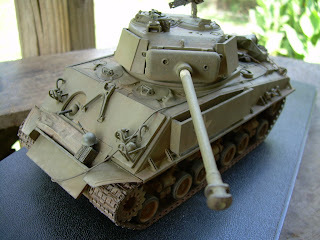 So a special thanks again to all those involved in the Modelmania show, and to IPMS. See ya'll at next years show. Thanks for looking in on the blog. Can't believe it's already the end of October. I've got to apologize for the absence here on site. It's really been a hectic summer at the shop, and in life. But with the year coming to an end, and folks start looking for things to fix other than their cars and trucks it might start to slow down a bit. With the slow down comes a chance to catch up on builds, and start a new one. This time around it's another Opel, the Maultier. There's two of these in the stash, this one being the regular cargo version. The other is a gun truck. Not really sure which direction this will be going yet. The mods to the 'ol Italeri kit will be many, as per usual. This will have an open engine bay. Maybe a tarp cover on the cargo bed instead of being open. I just don't know yet, but it will be fun... 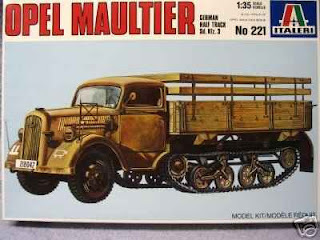 I really enjoy these trucks. Thanks for looking in again, hope to see ya soon. Drop a comment if you want to, it's always appreciated. Stalled again. 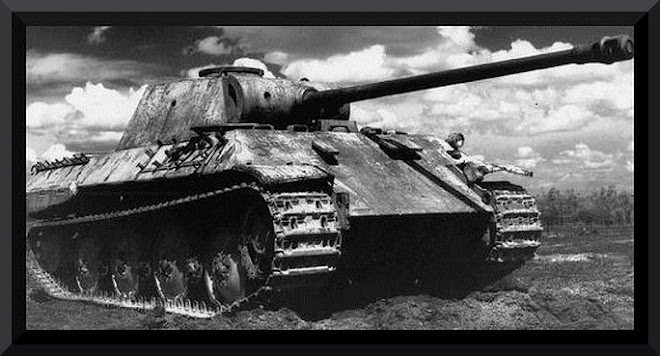 This time on the Panther, but not for long. I've been having some issues with paint. Keeping them fluid in 105 degree temperatures seems to be a small problem. They want to set up, and "coagulate" even with thinning. That will get worked out though. In the meantime, out comes an older build for a little attention. 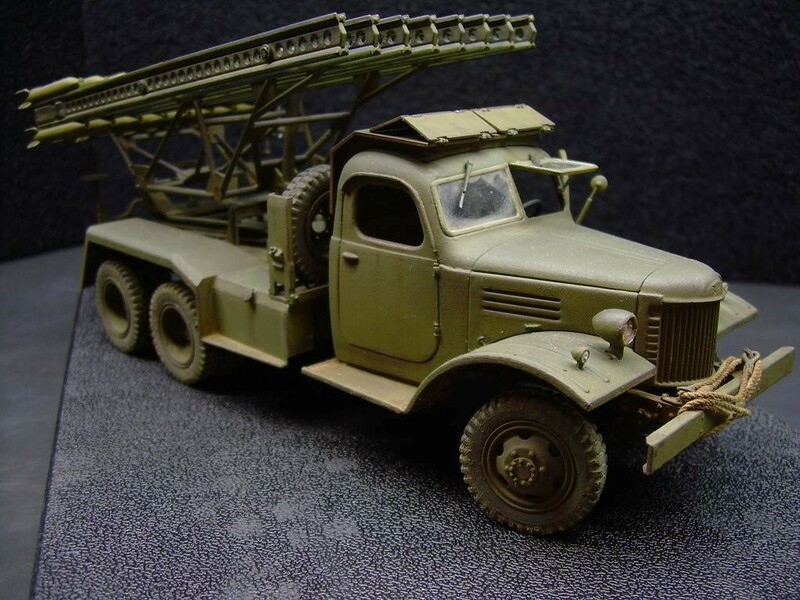 The Italeri/ Revell Katyusha in 1/35th. Built this a little while back and just didn't know where to go with it to be honest. Now I think I do, but we'll have to see if it works, or just gets messed up. I'd been thinking about the rockets on this thing, and how they'd be fired. A friend of mine showed me some facts (thanks again Simon) that these didn't have wires leading to the rockets as I had figured they must. It's an electrical charge running through the rails. He also told me to go easy on the stowage that might be stashed around on these due to the large fireball created when launched. Sound advice indeed! And something I hadn't considered honestly. So, here's a few up to date pics on where this stands at the moment. More work coming with it. Construction/ mods complete. 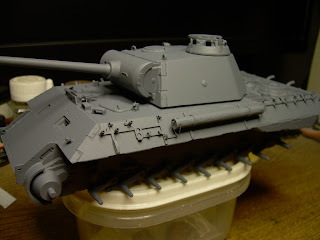 This build is finally in primer. Finally finished up with the parts I figured needed overhauling on this build. 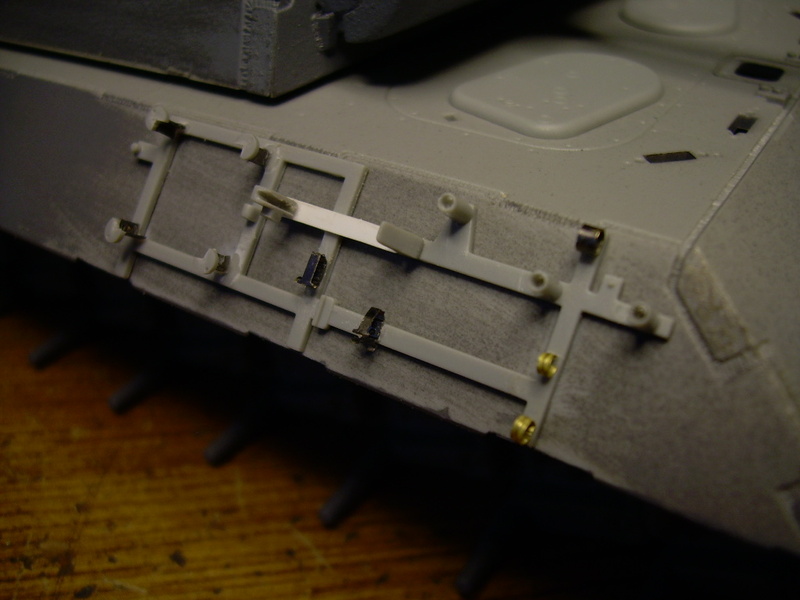 The spare track hangers are now on the hull and will allow for retaining pins and chain to be added. It also allowed for a little "bending" to be done on the hangers themselves, to show just a little abuse. Got a few hours on the bench... But didn't get a whole lot accomplished it seems. 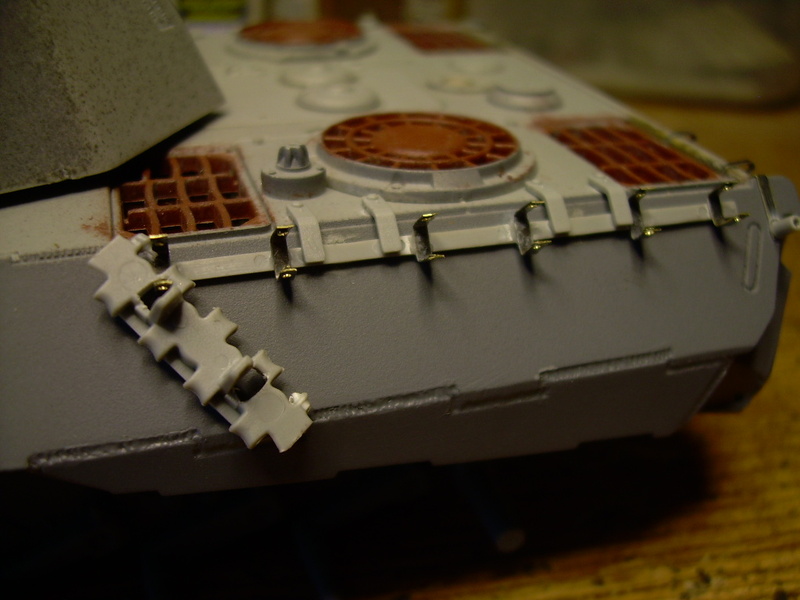 The tool saddles on the hull sides were the focus since the spare track brackets on the rear are still a WIP. Both of the kit pieces are lacking in detail, requiring another alteration and scratchbuilding session in order to be a bit more, well, more. The tool saddles, and tools were stripped of their mounts and everything re-built using bits and such from the spares box and some scratchbuilding.